A total of 251 people have lost their jobs at a recycled paper mill in Cheshire. 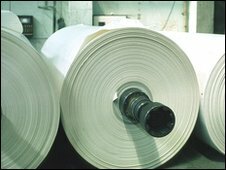 Bridgewater Paper Company Ltd, in Ellesmere Port, went into administration last week. Despite the job cuts, the firm is continuing to fulfil customer orders and administrators from Ernst and Young are looking for a buyer. In a statement, administrators said they had decided to make 251 of 300 staff redundant "with regret". A skeleton staff of 49 remain working at the mill while the company attempts to fulfil customer orders. Tom Jack, joint administrator from Ernst and Young said: "This is an extremely unfortunate situation for all employees affected and we thank them for their patience and support during this difficult time. "We are also grateful for the support received so far from Andrew Miller, Labour MP for Ellesmere Port and Neston, the North West Development Agency and the trade union Unite. "We continue to hold detailed discussions with a number of potential interested parties and still hope to find a buyer for the business as a going concern. "In the meantime we are also continuing to fulfil customer orders from stock whilst the sale of the business process continues."